The Runtime parameters panel allow setting the logging and error handling levels for NeoLoad. Other settings related to runtime are also available. NeoLoad can be configured not to flag as errors some requests that failed on recording. This is required when some errors are normal for the application. NeoLoad should play these requests to be realistic but should not flag them as error. This is typically the case for missing resources (images, css, and so on) that send back a 404 Not Found error code. It is necessary to check the Do not mark the specified HTTP error code when the same error occurs during the recording box to ignore the errors with the 404 code if the recorded code was 404. Requests with a valid return code (200 OK) on recording are flagged as errors if a 404 error occurs at runtime. The Collect separate statistics from each zone option allows NeoLoad to collect different statistics (average response time, hits/s, and so on) for all project items, such as requests or Containers, for each zone. This option is useful for a test that uses several Load Generators located in different geographic locations. Obtaining zone-specific statistics makes it possible to get location-specific statistics. This highlights any performance glitches due to the User geographical position with regard to the web application being load tested. Warning: This option may impact considerably the time spent to compute statistics at the end of the test and the time needed to generate a report, since it multiplies the amount of data collected by the number of zone used during the test. The Disable cache for requests and resources used by an extractor option forces NeoLoad to retrieve a response from the server and not to use cache, in order to be able to execute extractors. 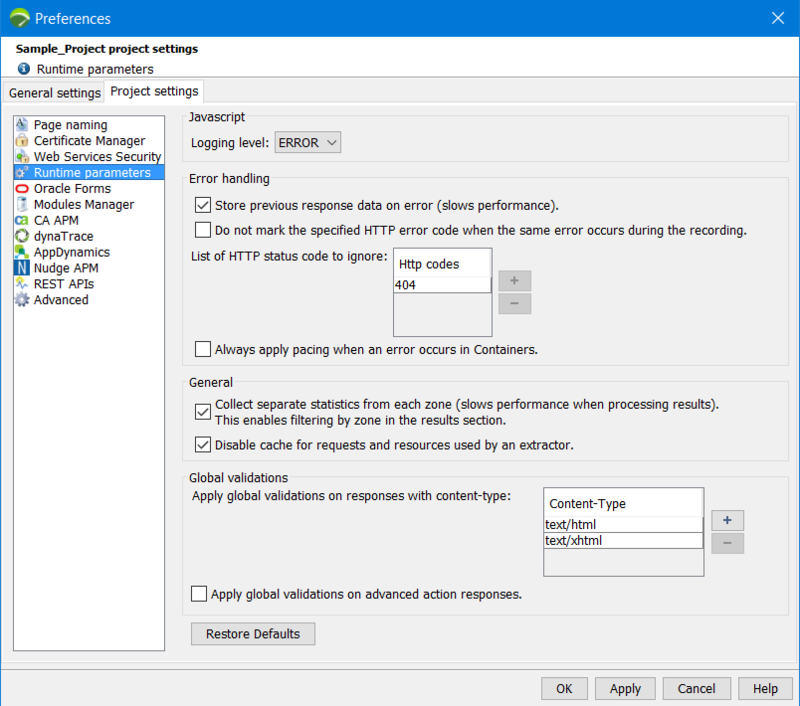 When global validation is applied to one or more Virtual Users, NeoLoad implements the following procedure to determine whether a response to a played request should be validated or not: NeoLoad retrieves the Content-Type header from the server response and checks to see if the header value appears in the list. If it does, NeoLoad then checks to make sure that the response content matches the various assertions. By default, only responses with a text/html or text/xhtml Content-Type are checked. The various Content-Types to be checked can be added or removed. For more information about global validation, see Global validation.